I was feeling like a tyrannosaurus rex (you wouldn’t want to be just any old dinosaur would you?) until I discovered that the term byte, so prevalent in computer lingo, was coined in 1956! Byte and I are the same age! My first exposure to computers was at UCLA. Those were the days of stacks and stacks of cards and if you messed up your program, you spent HOURS trying to find your error! Actually, I never used computers for anything useful. I didn’t even use a calculator! In the mid-1970s, calculators were not affordable for everyone and therefore, were not admissible for labs or tests. Yes, indeed, I used a slide rule! 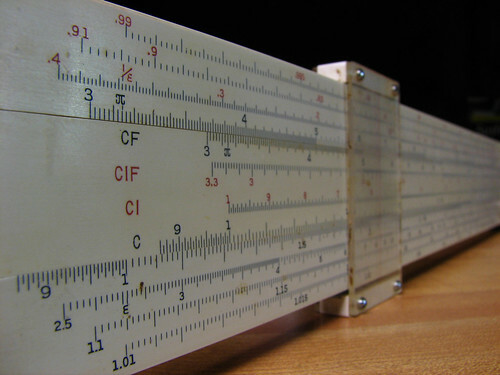 Calculus, physics, chemistry, statistics all calculated with a slide rule. I was a geek and didn’t even know it. I was the only female in many of my classes and I’m sure the guys all thought I was an alien anyway. (They all wore their slide rules on their belts AND they had round slide rules in their shirt pockets). IBM’s Werner Buchholz coined the term byte in 1956. Most of us have become acquainted with bytes, usually in the megabyte or gigabyte size, because we’re cognizant of how much storage we need to run our videos, store our pictures and music, power our mobile apps, or hold our documents on our computer. My original iPhone has 8 gigabytes of storage. I meant to check with my rocket scientist father, but I think that’s more than what was used to send the first astronauts into space! And now many of us are managing terabytes of information! To get a perspective, a terabyte is about 300 hours of good quality video or 1,000 sets of the Encyclopedia Britannica (that’s right up there with slide rules). Interestingly, tera comes from the Greek and means monster. That’s apt; we are talking about monster storage. However, in the eternal scheme of things, a terabyte is just a blip…a big blip, but a blip nonetheless. Waiting in the wings is the petabyte. That’s the equivalent of 20 million 4-drawer, filled filing cabinets or 500 billion pages of text! So in honor of the now extinct tyrannosaurus rex and the slide rule, I declare today to be Terabyte Tuesday.